Fancy yarn is now widely used in the textile industry. Fancy yarns are now widely used in the textile industry. 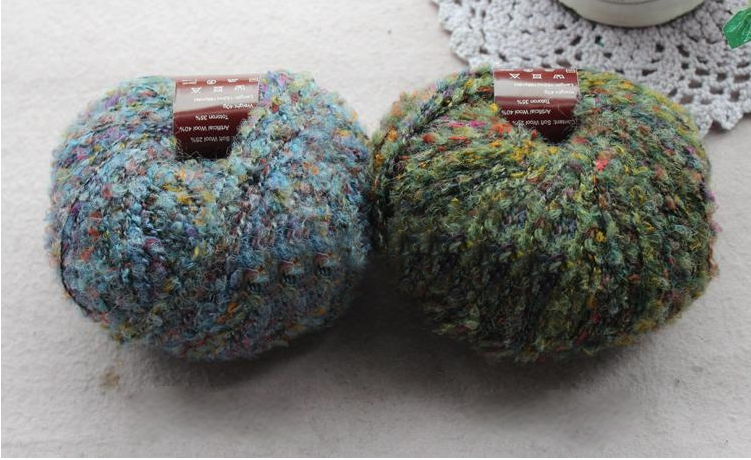 There are various kinds and styles of fancy yarns, such as brushed yarn, boucle yarn, knot yarn, core spun yarn, flat yarn, sequin yarn, big-belly yarn and so on. Fancy yarn using different technologies can also make different fabrics. There are two ways to apply the fancy yarn to a woven fabric. One is that both latitude and longitude lines using fancy yarns, or full warp or full weft using fancy yarns. This is more widely used in thicker and stiffer fabrics. In general, there are fewer cases where both latitude and longitude lines use full fancy yarns, because too much embellishment in the cloth impairs the simplicity of feeling, making it too messy. There are other problems. For example, the fabric is too heavy and weaving efficiency declines, and the production cost rises. The second method is to arrange the fancy yarns and ordinary yarns in a certain proportion in the warp and weft, to adjust the warp and weft density, and to decorate the fancy yarns in the fabrics to give them a special appearance and good wearing properties. The weaving process is also convenient and the production efficiency increases. The use of fancy yarns in worsted wool fabrics not only maintains the high-grade feel of the worsted fabric but also makes the surface of the fabric slightly garish in the simplicity. In woolen fabrics can also produce very popular products. In the yarn-dyed products, fancy yarns are the most widely used no matter the thick, medium, and thin fabrics. And the application of imitating natural fiber products and fancy gauze is becoming more and more mature. When fancy yarns are used on warp-knitting weft insertion machines, most of these fabrics are used for curtains. They have good drape, a strong three-dimensional effect and a certain degree of translucency. The former warp knitted jacquard fabrics are thin and light and can no longer meet the needs of the market. Therefore, warp-knitted weft insertion fabrics are embellished with bolder fancy yarns, sometimes with combinations of different thicknesses and types into the pattern, leading to not only a strong sense of three-dimensional but also drape. A large number of high-end interior decorative fabrics are using fancy yarn as raw materials. The products mainly cover curtain fabrics, including crochet curtains, warp knitting, burnt-out, printing, jacquard, edging, burnt-out printing curtains and etc. Like other fabrics, fancy yarn fabrics have a wide range of applications. In addition to clothing, it also involves bedding, curtains, kitchen and kitchen accessories, floor coverings, wall coverings, and furniture. From the point of style change and product characteristics, the fancy yarn fabrics have a special taste. As essential items in people’s daily life, some petty commodities can also use fancy yarns, such as gloves, socks, hats, scarves, headwear, bags, and so on. UNITEX has many years of experience in fancy yarn production. We produce fancy yarns that are both fashionable and innovative, at the same time, we develop exclusive products for customers. UNITEX — your trustworthy fancy yarn and wool fabric supplier. This entry was posted in blog and tagged fancy yarn.